Spacious, airy, electronic-tinged, late-night indie-rock for those that are sleep deprived and restless, but still need something good to keep their attention and pull them back into reality. 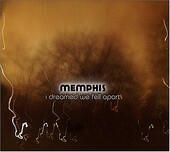 Memphis'I Dreamed We Fell Apart is a delicate, blurred line between dance and rock, pop and folk, intertwining all, while infusing the outcome with a healthy dose of white-boy, indie-soul, giving the record yet another flavor, and dimension, to absorb you. It's a passionate record that will find you soaking in it, as it grows more and more on you with every listen. I'll give it a B.